After a development period lasting a number of years and a successful beta phase that involved over 1,000 service providers, we are pleased to announce the release of the final version of the MailStore Service Provider Edition. The software solution for service providers is based on proven MailStore technology already used at over 17,000 companies and allows our partners to offer their customers modern email archiving as a service. The solution offers complete flexibility: It can be installed on the user’s own IT infrastructure and adapted to individual requirements thanks to extensive branding and scripting options. 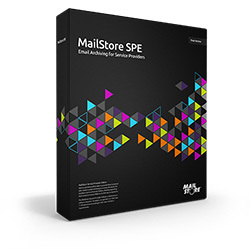 The MailStore SPE is scalable and, if necessary, highly redundant, making it suitable for both small providers, who can take advantage of an easy-to-use single-server mode, and partners with large numbers of customers, where a multi-server mode is available. Are you a service provider? After registering free of charge and with no obligation, you have the opportunity to test the solution for 30 days and receive access to key resources such as white papers and price information. Our SPE team will be happy to advise you personally. Email partners@mailstore.com or call (+49-2162) 502-990. Find out more about the release of the final version in our official press release.